‘Cause baby, names can’t cramp my style. Ask anyone where they were and they first heard Lady T, and they’re responses will be varied, but one thing’s for sure….they’ll tell you that she could belt out her songs and that if anything, she was definitely unforgettable. She may have been called many things when she was growing up, but when all is said and done, she’ll always be Lady T.
There has been so much to say about the lady since she transitioned that I’d be duplicating everyone thought of her that have already been said. I felt it was important to celebrate her life through the recording’s that she’s done. Believe me, it was time well spent. I also had a lot of help, thanks to the folks on Twitter and Facebook, helping to make sure I made this as comprehensive as possible. Many, many thanks to them. It should also be known that I was not alone in my quest. The one and only T. Grundy from RIBS, has a wonderful tribute to Lady T spread across two mixes, which are available here. There are more coming, so look back here during the next couple of weeks for more. Rest in peace, Teena- you will always be in our hearts. It’s all here! Thank you Podfather for another well done set. Will be playing this one for some time to come. RIP Lady T! A great legacy, but how sad to end the year on this note. RIP. Wow EJ! You outdid yourself on this one! Great tribute! RIP Lady T! The Queen Of Sophisticated Funk! I always loved her work. Great artist who wrote, produced and performed the majority of her work and definitely had magic when working with Mr. Rick James. 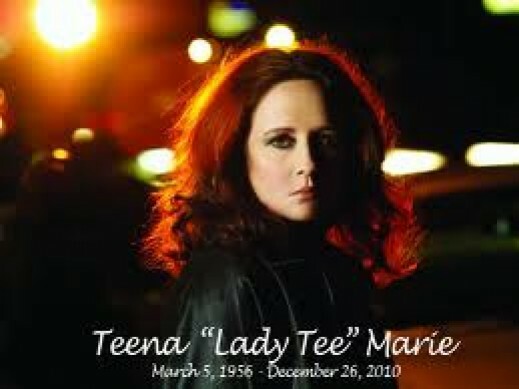 Classic music Ms. Teena Marie. And Thank you. ~ Outstanding lists!!!! Feels like we lost a family member. RIBS also has extensive list of songs. Luv u guys. Happy Blessd New Yr! I knew you would put together the best of the best from Lady T.
I had a co-worker in 7th Heaven yesterday listening to these Lady T tribute shows. Unbelievably thorough. Excellent job as always, EJ. That “Teena: Downtempo, Volume 1” is a beast. [and yes, I totally forgot about New York Undercover] thanks for the memory.